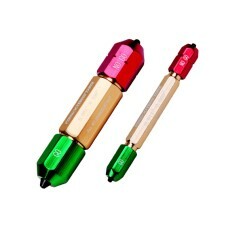 Fowler Pin Gages are on sale at Gaging.com! All Fowler products are available, including the New X-TENDED RANGE pin gage sets! The 53-880-823-0 Fowler X-TENDED RANGE Pin Gage Set is on sale at Gagi.. The 53-880-833-0 Fowler X-TENDED RANGE Pin Gage Set is on sale at Gagi..
53-885-000 Fowler Pin Gage Handle, for pins .011 - .060"
The 53-885-000 Fowler Pin Gage Handle, for pins .011 - .060" is on sale at Gaging.com! Color c..
53-885-001 Fowler Pin Gage Handle, for pins .061 - .250"
The 53-885-001 Fowler Pin Gage Handle, for pins .061 - .250" is on sale at Gaging.com! Color c..
53-885-002 Fowler Pin Gage Handle, for pins .251 - .500"
The 53-885-002 Fowler Pin Gage Handle, for pins .251 - .500" is on sale at Gaging.com! Color c..
53-885-003 Fowler Pin Gage Handle, for pins .501 - .625"
The 53-885-003 Fowler Pin Gage Handle, for pins .501 - .625" is on sale at Gaging.com! Color c..
53-885-004 Fowler Pin Gage Handle, for pins .626 - .750"
The 53-885-004 Fowler Pin Gage Handle, for pins .625-.750" is on sale at Gaging.com! Color cod..
53-885-005 Fowler Pin Gage Handle, for pins .751 - .832"
The 53-885-005 Fowler Pin Gage Handle, for pins .751-.832" is on sale at Gaging.com! Color cod..
53-885-006 Fowler Pin Gage Handle, for pins .833 - .916"
The 53-885-006 Fowler Pin Gage Handle, for pins .833-.916" is on sale at Gaging.com! Color cod..
53-885-007 Fowler Pin Gage Handle, for pins .917 - .1.0"
The 53-885-007 Fowler Pin Gage Handle, for pins .917-1.0" is on sale at Gaging.com! Color code..
53-885-008 Fowler Pin Gage Handle, for pins All Sizes .011 - .1.0"
The 53-885-008 Fowler Pin Gage Handle, for pins (All Sizes .011-1.0") is on sale at Gaging.com! ..